My husband, Neal, and I have known Jean O'Connor of Hat Creek Farm since around 1997. She has been actively involved in breeding wonderful Labrador Retrievers since we have known her. 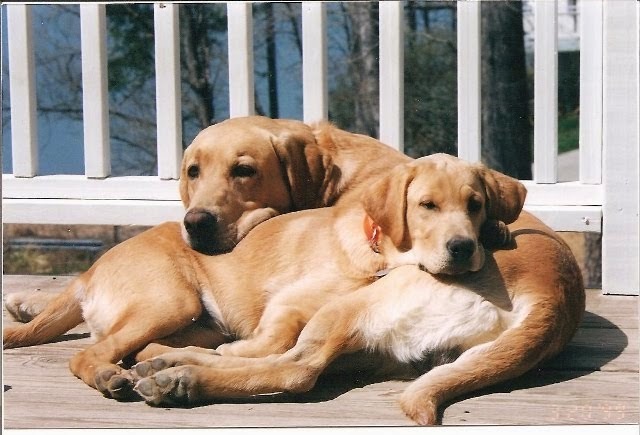 We attended church together for several years before she moved to the country to pursue her dream of living on a farm and breeding top quality retrievers. My first contact with Jean was shortly after losing our beloved Herschel, a black Lab. I contacted her because I was aware of her rapidly growing reputation in our area. Our timing was bad because she had no puppies available at the time. In my desperation, our hoped for yellow Lab turned into a wheaten colored Scottie, a wonderful animal, but definitely not a Lab! Jean is a person of integrity, who truly cares about her animals and the families which adopt them. Any monetary gains (sometimes I wonder how there are any) are secondary. She diligently tries to match the right dog to the right person or family. She spends a lot of time with each littter socialzing them and determining their personalities. I have no problem recommending a retriever from Hat Creek Farm to anyone. When the time is right for our next retriever, it will definitely come from Jean at Hat Creek. If you have never met her beautiful Belle or Handsome Gus, or seen a finely bred retriever puppy, it is definitely worth a trip to the country! Sad Footnote: Bubba passed away in 2010 at age 58, a man who was devoted to Jesus and his wife Debbie. Sadly Debbie passed away 8/24/2013 at 59 yrs of age. Two beautiful people with a passion for our Lord and wonderful friends to me. There are two special angels in heaven now and I will surely miss them, but I must believe they have a truly great dog along side them!